A new weed identification mobile app called ‘Weeds of Australian Cotton’ provides a key to the characteristics of 50 weed species. Using just the cotyledon shape as the only diagnostic selection, the 50 possible species can be rapidly narrowed down to less than eight possibilities in most cases. A NEW weed identification mobile app developed for the cotton industry could have wider application across a range of other crops in the broadacre farming sector. Developed as part of a Cotton Research and Development Corporation project, the ‘Weeds of Australian Cotton’ app provides a key to the characteristics of 50 weed species. Weed identification is a valuable skill and most farmers can identify the common and important weeds on their farms. For most non-botanists, identification is easiest when the plant is mature and flowering – but to be effective, weed control decisions need to be made well before flowering. Innokas Intellectual Services’ Dr David Thornby said the resistance profiles, even for closely related species, could be quite different, especially at the seedling stage. The new app allows users to make selections based on the observed characteristics of the plant, stem, leaves, flowers and seeds, the fleshiness or succulence of the plant and the presence of milky sap or latex. For grasses, users can key in specific details about the inflorescence, spikelet, floret and ligule features. As each detail is added the number of possible species reduces, until a few or just one remains as the best fit for the characteristics selected. “Once there are just a few remaining options, the user can look at the photo gallery and choose the best-fit identification,” Dr Thornby said. “The feature that really sets this app apart from other weed identification apps is that ‘Weeds of Australian Cotton’ includes a ‘cotyledon shape’ characteristic selection. Using the cotyledon shape as the only diagnostic selection, the 50 possible species can be rapidly narrowed down to less than eight possibilities in most cases. When cotyledons are present on very small plants found in the field, accurate identification can give growers a head start on planning a spray application. The timing of herbicide application is product-specific but the general recommendation is for weeds to be ‘small and actively growing’. As a rule of thumb, ‘small’ would include pre-tillering for most grass species, less than five-centimetre diameter for most rosette-forming species, and up to about five true leaves for other types of broadleaf species. As for ‘actively growing’, this is simply the absence of visible signs of moisture stress. 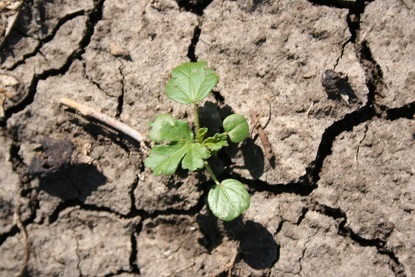 “Coverage is probably the most important factor to consider if weeds were sprayed at cotyledon stage,” Dr Thornby said. “Where feasible, increasing the water rate is the usual response, but it can be hard to hit such genuinely small targets. At this very small size good control could be expected, but they would have to come in contact with the chemical and so it is often practical to compromise by waiting until a couple of true leaves are present. Dr Thornby said it was best not to make too many assumptions about the weed spectrum present based on what was observed in the previous year. He emphasises the need for accurate identification and highlighted the fact that the app does not include every possible plant that could be growing on a cotton farm. “The app only includes the 50 species that the development team identified as the key species affecting cotton production,” he said.